Dr. Nguyen Thi Hiep, Dean of the Biomedical Engineering Department in the International University – a member of the Vietnam National University Ho Chi Minh City, has spent 10 years researching for a special kind of glue to stick wounds quickly in one minute. Her success promises a better chance of recovery for people who live far away from hospitals. Dr. Nguyen Thi Hiep (first on the right) instructed a research team in the International University. In 2018, 37-year-old Dr. Nguyen Thi Hiep was given the ‘Women in Science International Rising Talents 2018 Award’ by L’Oréal - UNESCO Fund thanks to her research ‘Smart Gel to Heal Wounds’. 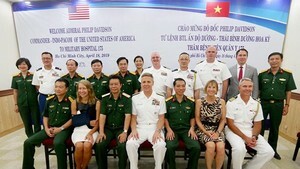 Dr. Hiep is the second female in Vietnam to be honored with this award in the last 20 years. The idea to invent a special type of gel for fast healing of wounds has been sown in her mind since young, as she once experienced the painful feeling of a large cut yet could not do anything to improve it except for travelling a long way to hospital to stick the wound. She at that time wished there would be something to stick the cut immediately. Another moment that inspires her research is the time she witness the tragic death of a farmer due to too much blood loss after crashing into a tractor. The burning wish of creating an aid to stop the blood flow in serious wounds urged her to passionately pursue her study. After more than 10 years, in 2017, Dr. Hiep was able to invent a new kind of smart gel to stop bleeding, kill bacteria, and reduce the generate new tissues. This first-aid tool is particularly useful for those living far away from hospitals. Explaining the operation method of this gel, Dr. Hiep said that the bio-gel is made from hyaluronic acid – a natural protein, and chitosan – complex molecules found in chitin shells of shrimp and other crustaceans. The gel also includes other components like silver and Nano curcumin (a chemical commonly found in turmeric). This complex powder can be dissolved at once in water and then used to stick onto wounds. If the injured person shows signal of too much bleeding, this substance can be used to stop the flow. The gel aims at residents in remote areas like farmers, fishermen, people working in islands and on mountains. 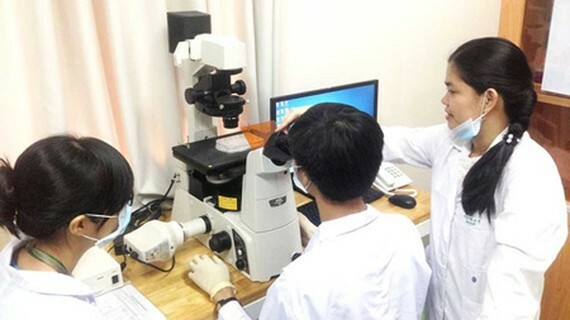 Dr. Hiep’s success is a milestone in the field of tissue generation and the regenerative medicine branch in Vietnam, promoting the development of novel treatments using bio-materials. As shared by Dr. Hiep, the largest obstacle in her research was the financial issue. However, she did not passively wait until obtaining modern equipment or full human resources to carry out her study. In 2012, she came back to Vietnam after 6 years learning in South Korea, and began her research while trying to seek sufficient financial aid. At first, she and her team had to borrow many devices from universities. She even used the money earned from her international articles, salary, and awards to maintain the work. She now enters the next stage in her research, after being successful in experimenting the gel on animals. She wants to use this special gel to inject into articulatio genus and regenerate stem cells as well as tissues for cancer patients. Dr. Hiep shared that since chitosan resource is so rich in Vietnam thanks to a great quantity of shrimps and crustaceans, the estimated price of this gel will be very competitive. She wishes to commercialize her invention and offer a new cheap methods of wound treatment to the poor. She also expressed her wish to seek partners from both the government and interesting units to launch her product to the domestic market, contributing to fostering the development of medical technology in the country and reducing medical cost to patients. According to Professor Dr. Vo Van Toi from the International University, the smart gel of Dr. Nguyen Thi Hiep makes good use of domestic materials, and thus becoming very economical to the Vietnamese as well as people in developing nations. Dr. Huynh Chan Khon from the Department of Biomedical Engineering of the International University also positively commented on Dr. Hiep’s invention, saying that it is especially effective for injured people in remote areas who cannot reach timely medical helps.